Apartments and rooms Tatjana are located in Omiš, a small town located at the mouth of the river Cetina. Apart from the multitude of cultural and historical sights you can visit in Omiš, you will be fascinated by beautiful beaches and good cuisine. Sports and recreation lovers can enjoy free climbing, rafting on Cetina rapids, beach volleyball, running, windsurfing, biking, scuba diving and many other activities.Depending on your needs and wishes, you can stay in a large apartment for 6 people or in one of the two rooms for 3 people. If you decide to book an apartment on the second floor of the house, you will have a wonderful sea view, two bedrooms, a well-equipped kitchen, a bathroom with a shower and a balcony. The rooms are located on the 1st floor of the house, each with a double bed and one auxiliary bed. Each room has its own bathroom with a shower and you can use the well-equipped common kitchen. The room offers the view of the sea and the yard, and you also have a 40m ^ 2 large shared terrace at your disposal.For any additional information you can always ask the friendly hosts. Enjoy the sunbathing and swimming on a beautiful beach 500m away from the accommodation, but you can also take a walk around the city center which is 600m away. The nearest shop is 200 meters away, and there are tennis courts 700m from the accommodation. Try one of the traditional dishes in the restaurant some 500m away or refresh yourself with a cold drink in the bar. At a distance of 500m you can rent bicycles or motorboats. Omiš is the right destination for your vacation? Tatjana is the name of this object, located in Omiš. This object is 500 m of air distance away from the sea. During the summer days, look for refreshments for yourself and your family on the beach that is 500 m away from the object. The beach is: sandy, pebble and rocky. To stay on the beach, make sure that you bring towels and protect yourself from the sun with a hat or sunshade, and use a protective cream. Tatjana has a secured parking, which is another advantage of this accommodation, and is of crucial importance if you travel by car on your vacation. Any additional questions related to the beach or destination Omiš please check with your host because they still know best the location. We wish you a warm welcome to our facility Tatjana in destination Omiš. 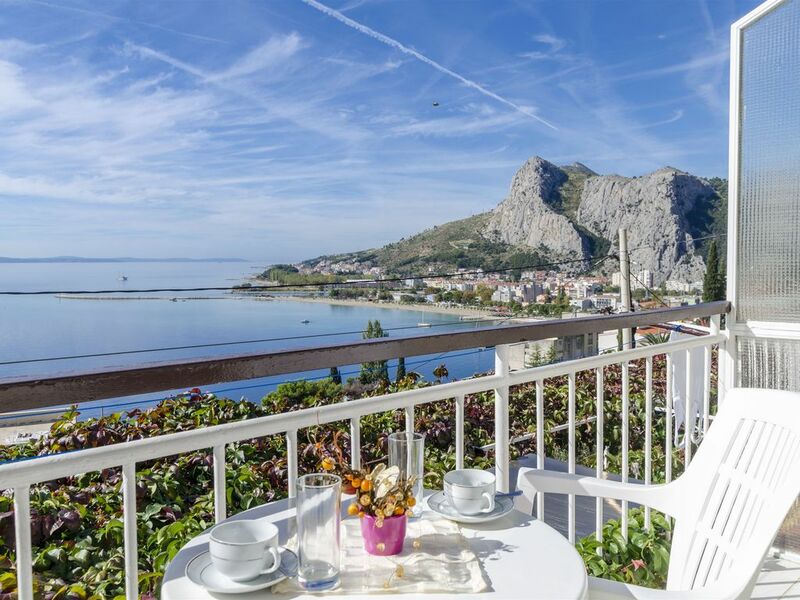 Accommodation Tatjana is located 500 m from the sea, 600 m from the center in the town Omiš. This accommodation offers a view of the Sea. Type of beach sandy, pebble and rocky. Private accommodation Tatjana is ideal for 6 persons and has 2 rooms in the accommodation. Accommodation is equipped with: Heating, Air conditioning, Radio, Television, Internet, Iron, Washing machine. To make the hot summer days more bearable in the accommodation there is an Air conditioning. partially (extra fee paid to host). 10 € per day. partially (extra fee paid to host).